CCTV is a priority for security on any premises, be it commercial or domestic. We can design and install a suitable system for any business or domestic need. Not only is it a necessity to monitor entry and exit points, CCTV has many more benefits. CCTV is also excellent for surveillance. For commercial premises, it can be used as an excellent deterrent (many a trespasser will change their mind on seeing a camera), to monitor staff and to be able to keep an eye on your business from anywhere in the world. 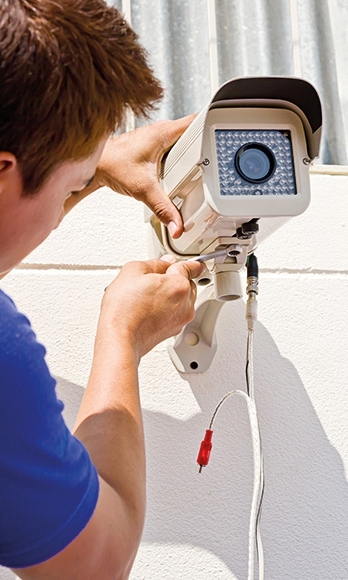 For domestic use, again CCTV is not just for security and deterrent. You can have a system installed so you can monitor any room in your property from wherever you are and playback to review what has happened whilst you were out. Our systems automatically log disturbances, we will give you your own unique web address where you can log in to your camera system to view real time footage or playback to view events without having to trawl through a full days recording, be it from a laptop, PC or your phone. In terms of security, the system will automatically record whenever there is any activity in the cameras view and this would make superb evidence for the appropriate authorities. CCTV is ideal to monitor mares and foals. You can utilise the system to view each mare from one point within your operation, or externally wherever you are in the world, to avoid the necessity of checking each box individually throughout the day/night. Just contact us to arrange a no obligation site survey.